Habit: Annual to subshrub, hairs +- 0 or simple, ill-smelling. Leaf: entire to deeply lobed. Inflorescence: flowers 1 in branch forks. Flower: calyx circumscissile near base, leaving +- rotate collar in fruit; corolla funnel-shaped, white or +- purple, lobes 5(10); stamens attached below tube middle; ovary 2- or 4-chambered. Fruit: capsule, leathery or woody, prickly; valves 2--4 or irregular. Seed: +- flat, black, brown, gray-brown, or tan. Species In Genus: +- 13 species: warm regions, especially Mexico; several ornamental, some source of drugs. Etymology: (Hindu: ancient name) Toxicity: All species. TOXIC. Habit: Annual or perennial herb, 5--15 dm. Stem: white-puberulent. Leaf: 7--20 cm, ovate, entire or coarsely lobed. Flower: erect to nodding; calyx 8--12 cm, ribbed at least toward base, lobes +- 2 cm; corolla 15--20 cm, puberulent, white, lobes 1--2 cm, tips long, narrow; filaments 13--15 cm, anthers 12--15 mm; style 15--18 cm. Fruit: irregular-valved, nodding, 25--30 mm wide, puberulent; prickles 5--12 mm. Seed: 5 mm, flat, tan; margin grooved. Chromosomes: n=12. Ecology: Sandy or gravelly open areas; Elevation: < 2200 m. Bioregional Distribution: NCoRI, c&s SNF, Teh, GV, CW, SW, D; Distribution Outside California: to Utah, Texas, Mexico. Flowering Time: Apr--Oct Note: Cult for showy flowers; may have been introduced by early Spanish; possibly conspecific with Datura inoxia Mill. 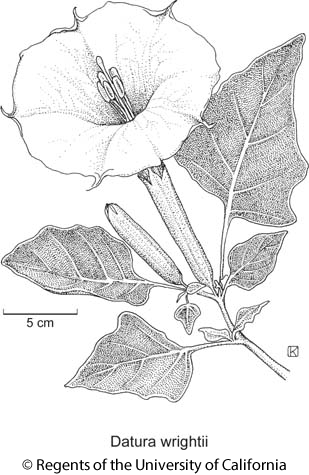 Citation for this treatment: Michael H. Nee 2012, Datura wrightii, in Jepson Flora Project (eds.) Jepson eFlora, http://ucjeps.berkeley.edu/eflora/eflora_display.php?tid=22389, accessed on April 19, 2019. NCoRI, c&s SNF, Teh, GV, CW, SW, D; Markers link to CCH specimen records. Yellow markers indicate records that may provide evidence for eFlora range revision or may have georeferencing or identification issues. Purple markers indicate specimens collected from a garden, greenhouse, or other non-wild location.